Peel and dice the potatoes into 1 inch cubes. String the beans and halve them, cut them into one inch pieces. Shell the peas. Wash cauliflower and separate the cauliflower florets. Peel and dice the carrots into 1 inch cubes. Peel and dice the pumpkin into 1 inch cubes. Add warm water to one cup of scraped coconut and extract thick and thin milk. Keep aside. Dissolve tamarind pulp in half cup of water. Heat a little oil and sautÃ© 2 whole red chillies, cumin, coriander, garlic and the remaining half cup of scraped coconut till a nice aroma is given out. Grind into a fine paste. 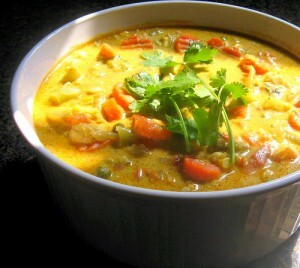 Boil the vegetables in the thin coconut milk with turmeric powder, tamarind extract and salt till three-fourth done. Add the ground masala and cook for 10 minutes. Heat a little oil separately and add the remaining red chillies broken into two, mustard seeds and urad dal. Add curry leaves and add this to the vegetables. Continue cooking the vegetables till done. Then add the thick coconut milk and simmer for two to three minutes. Serve hot with boiled rice.